I know what you’re thinking, folks, “Really, Angela? 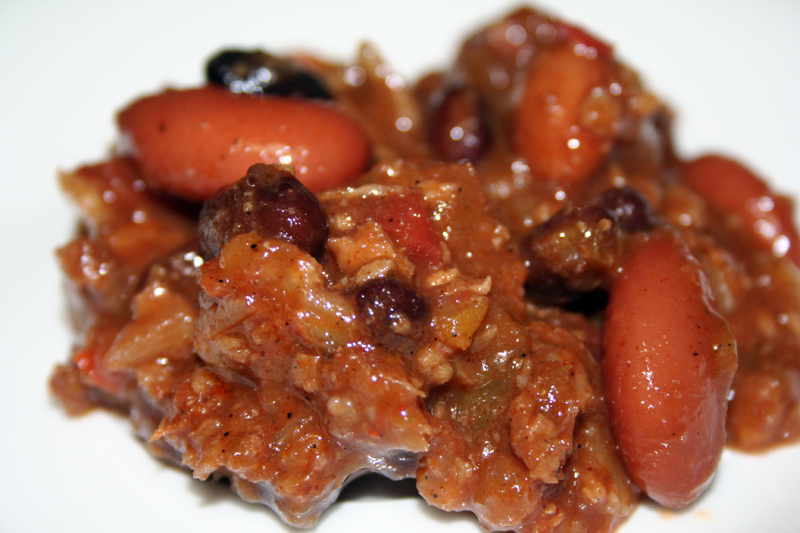 Vegetarian chili?” But you must, must, must try this, die hard meat eater or no. My father, who I am sure is 99% dinosaur (and I’m talking the T-Rex variety) loves this chili like no other, and he doesn’t give out the compliments for non-meat dishes lightly. He’ll even eat this straight up as a main course with not a bit of meat on the side. If that ain’t a testament to quality, then I don’t know what is. My dad scored this recipe for my sister, Lexi, who then passed it to me. It utilizes veggie crumbles, found in the frozen food section with the meatless entrees and veggie burgers. A solid number of veggies and beer help round out the flavor for a chili that won’t for one second make you miss beef. Dress it up with some shredded cheddar or sour cream and you are in business. It true slacker mode, I have eaten this cold with Fritos scoops and guess what? Still delicious. PS. This was the first time that my sister had ever been in the kitchen with me for a photo shoot for the blog. She laughed at how small the plate was that I took the macro photo from. Even though I have a bigger kitchen now and more natural light, I still shoot small like I did in NYC in the itty, bitty kitchen with not a bit of sunshine to illuminate my food. This photo above is her demo of the scale of the photo shoot, and not the amount of chili that I gave her as her ration. She ate two full bowls, thank you very much. In a large pot or dutch oven, heat olive oil. Add the vegetables and sauté until translucent. Pour in the beer, the stock and the bay leaves and let simmer until most of the liquid has evaporated. Stir in the veggie crumbles and let warm while you start opening cans. Add the beans, tomatoes and salsa and stir. Mix in the crushed tortilla chips, chili powder, garlic powder and oregano. Let simmer for about 10 minutes and then taste for salt and pepper. You can amp up the heat with hot sauce or cayenne pepper if things are too tame. Serve chili with shredded cheese, chopped onion and diced jalapeno. May 19, 2010 Angela G.
Bread and butter is really a lot more elegant than we treat it as, kids. It’s a fine marriage between savory, sweet, crusty, doughy, chewy, pliable goodness. It comes in infinite permutations, such as a few of my favorites – poblano cheddar bread (from Best Buns in Arlington, VA) with Normandy beurre, or a crusty baguette with a slathering of lavender infused oil and butter. Both are divine, but require a trip to DC or Marseille (the restaurant in NYC, not the city, although I wouldn’t mind…) For my money, and for the sheer ease to reward ratio, I’m a fan of the infused oil with whatever artisan bread I can get my hands on easily. Infused oils aren’t complicated – cheap oil works and just about any dry herb or spice can be used. Just make sure to follow a few rules. One – really and truly don’t include garlic in making your homemade oils unless you are going to consume them immediately. Garlic, being a lovely root that grows in the earth, harbors tons of bacteria that would love to thrive in a bath of olive oil. And voilá, you’ve got some botulism on your hands. No es frio. Some folks say that if you acidulate the oil and refrigerate it, you are in business. I don’t leave my tummy up to fate. If you want your oil to be garlicky, try muddling your finished oil with fresh or roasted garlic before serving. Or, for the true infused garlic oil experience, just buy some from a licensed supplier who will guarantee you a botulism-free experience. This is just a reminder that all cooking is chemistry, and while most chemistry mistakes in the kitchen will result in bad tasting food, some will actually result in illness. Improperly infused garlic oil is one of those mistakes. Secondly, as much as it looks gorgeous to store your oil on the counter, I’d advise you to keep it in the fridge. It’ll last longer, stay fresher, and again, no risk of contaminants. Lastly, I call for thai chilies in this recipe, that when you grind them, create a bit of pepper dust. This in turn, if inhaled, will give you a few coughs. Be careful with that. Don’t breath in too much when you are transferring the pepper to the oil. If you want to play it safe, use a milder chili like an ancho or pasilla. Or use pre-crushed red pepper and avoid the dust altogether. Likewise, you can go hotter as well – habanero or ghost chilies even. Just be careful as you work with them, because they can be vicious. This oil is lovely as the preface for a rustic italian meal – mix a few tablespoons of oil with a pinch of kosher salt and some chopped garlic and use it as a dip for focaccia or ciabatta. You can also use a few tablespoons as the basis for sauces and dressings. In a spice grinder or food processor, grind chilies and herbs together. I like to use a food processor so that everything gets a rather rough chop. Using a cooking thermometer, heat oil in a heavy pan until 200°. Carefully pour the chilies into the oil and let cook at 200° for 4-5 minutes. Turn the heat off and let the herbs and chilies continue to infuse the oil as it cools to room temperature. Pour into a clean bottle and store in the fridge for up to a week. Where I live in NYC, we don’t readily have Thai delivery. Not a huge deal to go out and get Thai food, except for the fact that it’s usually way more expensive than it needs to be and entirely too fancified. When I was in Arlington, we had some exemplary Thai restaurants, a few of them specializing in homestyle thai that I cannot even find here. I’m sure it exists – it’s just that it’s such a trial and error process, I rarely want to waste my dough on a new place. My favorite dishes made with a homecooked sensibility (best made in VA at the Thai Square, with a close runner up of Rabieng) all include a heavy dose of chilies and basil. In an effort to quell my jonesing for home, I started making a few of these dishes for myself with excellent results. Mostly because I could gauge the freshness of the ingredients and make massive quantities for friends and family at half the price of restaurant dining. I really don’t mind spending money, but the food quality and difficulty in preparation has to be commensurate to the price. I can guarantee you that the folks at Thai Square aren’t using caviar and foie gras in their krapow – just good flask steak and fresh veggies. So why would I pay twice the amount here in NYC for old beef and overcooked veggies? Forget it. This incredibly simple fried rice is versatile, and the combination of garlic, chilies and fragrant basil is a lovely alternative to the usual fried rice. I quite often make it with lean, white meat chicken, but my absolute favorite is to fold in lump blue crab in the last few minutes of cooking. Try it sometime as a lovely alternative to Chinese takeout. It suits your taste buds a whole lot more. Season rice with the salt, pepper, ginger and scallions. Stir and set aside. Heat oil in a wok or large skillet until smoking. Toss in your protein (unless you are using crab meat or raw shrimp – then you should skip to the next step). Stir for about a minute and then toss in basil leaves, bell peppers, red onion, chilies and garlic. Stir for a minute and then add the fish sauce and oyster sauce. If you are using shrimp, add it now. Stir to combine and then add the rice. Keep on stiring until all ingredients are incorporated and rice starts to crisp up a bit on the bottom of the wok, about 2-3 minutes. If you are using crab meat, add it in the last one minute of cooking. Serve immediately. 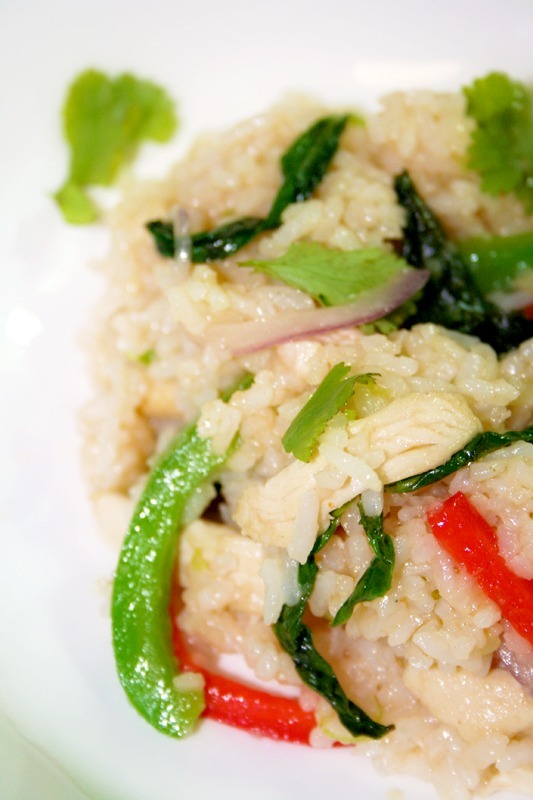 Before eating, squeeze a wedge of lime over the rice and toss some cilantro leaves over the top. The zesty cousin of red-hot Texas chili, this Cincinnati style chili mac has a whole lot of soul in the form of a long line of herbs and spices. Originally perfected by Greek immigrants, this slow-cooked, saucy treat is known for its long list of seemingly unusual ingredients. In addition, the chili is traditionally served without beans and over spaghetti – you’ll see when you make this chili that it actually cooks up like a bolognese.